Slaves, foundlings, prostitutes, nuns, homosexuals, exiles, the elderly, and mountain communities - such groups stood at the margins of society in premodern Italy. But where precisely the margins were was not so easily determined. Examining these minorities as the buffer zones between more readily recognizable centers, At the Margins explores identity as a process rather than a fixed entity, stressing the multiplicity of groups to which individuals belonged. 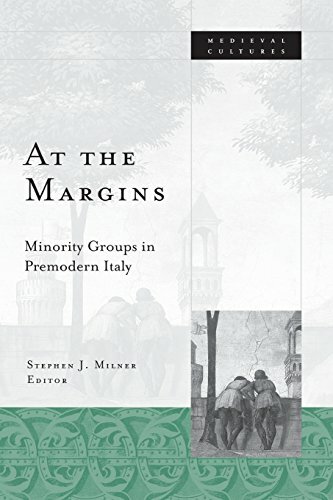 By tracing the shifting relations of social margins to centers in Italy between the thirteenth and seventeenth centuries - and showing how these shifts in turn relate to social order and identity formation - the authors challenge entrenched ideas about the nature of the Renaissance and its role in shaping modernity. Behind much cultural theory lies a critique of the centrality of modernity and its foundations in the discourse of Renaissance humanism. And yet, as this volume reveals, the insights of contemporary cultural theory serve to expose the flaws in this picture of cultural hegemony and, in decentering the Renaissance, return it to the heart of cultural debate. Stephen J. Milner is senior lecturer in Italian at the University of Bristol.Contributors: Judith Bryce, U of Bristol; Peter Burke, U of Cambridge; Samuel K, Cohn, Jr., U of Glasgow; Derek Duncan, U of Bristol; Steven A. Epstein, U of Kansas; Philip Gavitt, Saint Louis U; Mary Laven, Jesus College; Michael Rocke, Harvard U; Dennis Romano, Syracuse U; Kenneth R. Stow, U of Haifa; Anabel Thomas.